New Yasuie Cards appear that enhance the Yasuie strategy of duplication. Shadowstitch – AUTO (VC): At the end of a battle in which your Unit attacked a Vanguard, and that attack didn’t hit, draw 1 card, choose 1 card from your hand, place it on the bottom of the Deck. 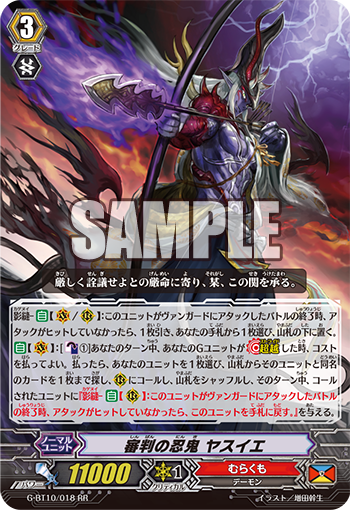 Shadowstitch – AUTO (VC/RC): At the end of a battle in which this Unit attacks a Vanguard, if its attack doesn’t hit, draw 1 card, choose 1 card from your hand, place it on the bttom of your Deck. AUTO: [Counter Blast 1] When your G Unit [Stride]s, you can pay the cost. If you pay it, choose 1 of your Units, search your Deck for up to 1 Unit with the same name as that Unit, Call it to (RC), shuffle the Deck, during that turn, the Called Unit gains “Shadowstitch – AUTO (RC): At the end of a battle in which this Unit attacks a Vanguard, if that attack doesn’t hit, return that Unit to the hand.”. For Today’s Card, we’re introducing from the 10th Booster Pack “Raging Clash of the Blade Fangs” (on February 3rd, 2017): 《Murakumo》’s G Unit “Rogue Deity of the Third Realm, Yasuie Gouma” and the new Grade 3 “Stealth Rogue of the Trial, Yasuie”. “Rogue Deity of the Third Realm, Yasuie Gouma” makes his historic debut with a historic first! It has an amazing ability that allows you to Stride Duplicate itself by Calling G Units to Rearguard Circles! By flipping a face-down “Yasuie Gouma” in your G Zone face-up, you can Call up to 2 face-up “Yasuie” cards in your G Zone! Since its own ability flips 1 copy face-up, you’ll be able to call at least 1 “Yasuie Gouma”, which means it can use it as the first Stride, and the fact it doesn’t really need a cost is quite the charming feature. And it also has a 【Shadowstitch】 ability that activates when it doesn’t hit, allowing you to draw 1 card and place 1 card from your hand on the bottom your Deck. This way you can return Units you want to Clone along with Triggers to your Deck, which are all good for the Call abilities of your Grade 3 “Yasuie”. “Stealth Rogue of the Trial, Yasuie” can call a Unit with the same name as a chosen Unit from your Deck using its Stride Bonus! The Unit it Calls gains a 【Shadowstitch】 ability, that when its attack doesn’t hit, it returns to the hand. If you have no Rear-guards present, you can call “Stealth Rogue of the Trial, Yasuie”. By returning itself to the hand, you can fill the cost of Stride next turn. And just like “Rogue Deity of the Third Realm, Yasuie Gouma”, it has a 【Shadowstitch】 ability to draw 1 card and return 1 card to the bottom of the Deck as well. By duplicating it, it can activate this ability in the Rear-guard, meaning it can serve as a great attacker. Apply pressure with your 【Shadowstitch】 ability. Also, “Raging Clash of the Blade Fangs” contains many cards that enhance 《Murakumo》’s 【Shadowstitch】, so enjoy. Q. What is the Power of a “Yasuie” called to the Rearguard? A. They have 15000 Power. Q. If you use the same name Call Stride Skill of “Stealth Rogue of the Trial, Yasuie”, can you target a “Rogue Deity of the Third Realm” that’s a Rear-guard? A. The Deck and G Zone are two different locations, so you cannot Call “Rogue Deity of the Third Realm, Yasuiie Gouma”. Q. Okay, “Rogue Deity of the Third Realm, Yasuie Gouma” is Locked by “Star-vader, Freeze Ray Dragon” or “Flame Wing Steel Beast, Denial Griffin” is Retired, what happens? A. They return to the G Zone face-up. If they’d be returned to the hand, they also return to the G Zone face-up.